Three Toyota HiLux pick-ups will compete in the world’s toughest automotive race, the Dakar Rally in South America, beginning on January 6. 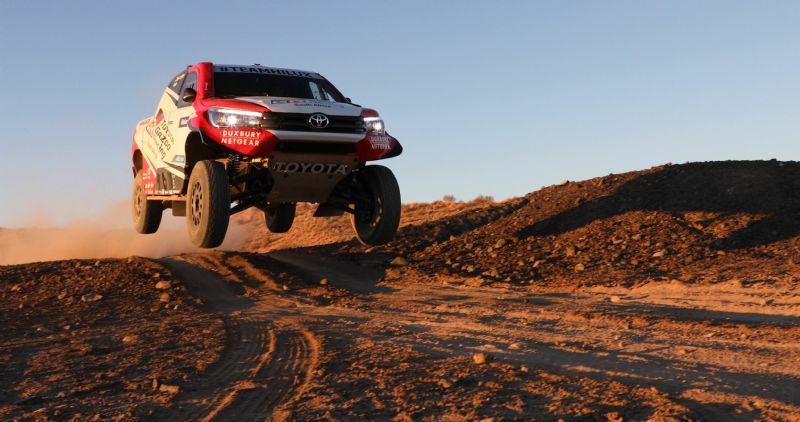 Toyota GAZOO Racing South Africa has built all-new cars for the 40th running of the famed rally raid, and retained leading drivers Giniel de Villiers and Nasser Al Attiyah. De Villiers and navigator Dirk von Zitzewitz won the Dakar Rally in 2009 and have recorded four podium finishes in the event for Toyota. De Villiers and Toyota are unbeaten in the South African Cross-Country Championship since 2015. Al Attityah and Mathieu Baumel have won three FIA Cross-Country World Cup Championships in a Toyota HiLux. 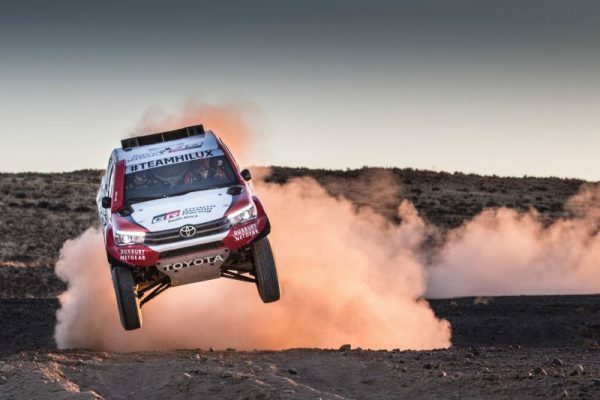 The third HiLux crew is Bernard ten Brinke and Michel Péron, giving Toyota GAZOO Racing SA a cosmopolitan team of a South African, German, Qatari, Dutchman and two Frenchmen. Ten Brinke competed in Dakar 2016 in a privately entered HiLux. The all-wheel-drive Toyota HiLux entries are lighter than the 2017 cars, with new independent rear-suspension geometry offering 12 per cent more travel. The naturally aspirated V8 engine is now mid-mounted, sitting just behind the front wheels, in between and slightly below the crew. It breathes through a larger FIA-sanctioned 38mm restrictor, as per new regulations for the 2018 event. The team has logged more than 3000km of testing in South Africa – equivalent to 60 per cent of the competitive driving in the 2018 rally. Team principal Glyn Hall said the combination of increased power, reduced weight and greater suspension travel will suit the soft sand sections of the rally’s opening stages in Peru. “We decided to radically alter the layout and geometry of the car, incorporating everything we’ve learned over the past five years,” he said. Toyota first entered the Dakar Rally in 2012, taking second place on debut. January’s Dakar Rally marks the tenth edition of the event since it moved to South America in 2009. The rally runs from January 6 to 20, beginning in Lima, Peru, travelling through Bolivia and finishing in Cordoba, Argentina. There is only one rest day on January 12 in La Paz, Bolivia. There are 14 stages and 5000km of competitive driving, with 4000km of liaisons between stages. Seven of the 14 stages are either completely off-road or in dunes. The first five stages are in Peru, two of them looped, before stage six takes competitors into Bolivia for two high-altitude stages and then six stages in Argentina. The Dakar Rally attracts more than 500 competitors from some 60 countries – in cars, trucks, motorcycles, Quads and UTVs (off-highway utility vehicles). Security threats in Mauritania forced the cancellation of the 2008 event and its relocation to South America in 2009. The 2018 event marks a return to Peru for the first time since 2013. Former Toyota rally world champion Spain’s Carlos Sainz won the Dakar Rally in 2010 and Australia’s Toby Price won the motorcycle category in 2016.